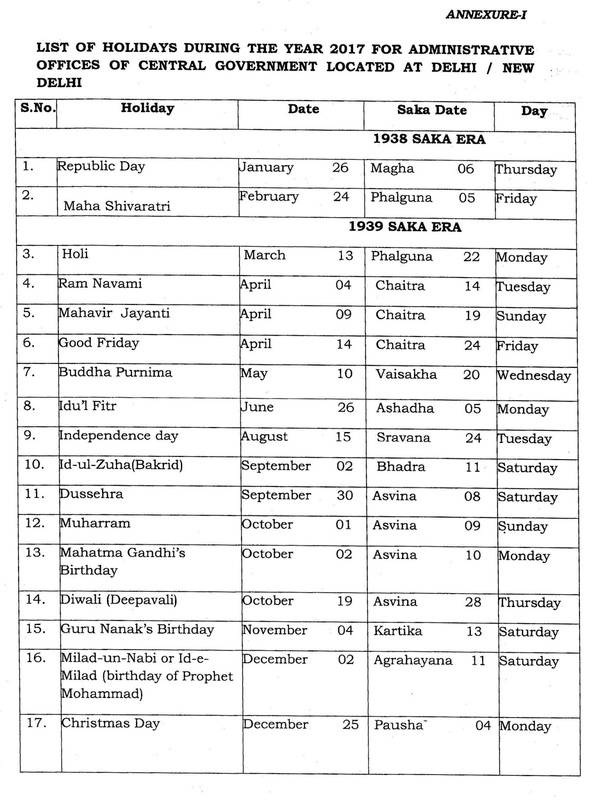 Subject: Holidays to be observed in Central Government Offices during the year 2017- reg. 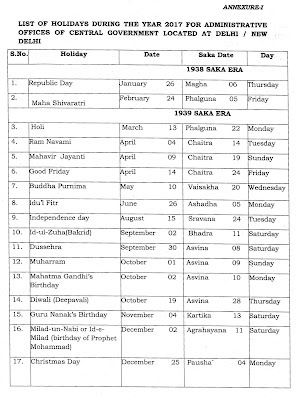 It has been decided that the holidays as specified in the Annexure -I to this O.M. will be observed in all the Administrative Offices of the Central Government located at Delhi/New Delhi during the year 2017. 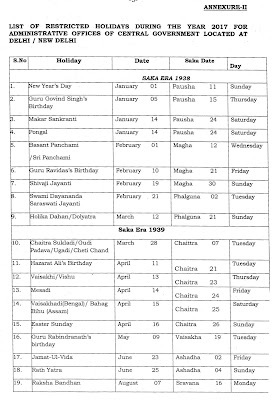 In addition, each employee will also be allowed to avail himself/herself of any two holidays to be chosen by him/her out of the list of Restricted Holidays in Annexure - II. Employees Welfare Coordination Committee in the State Capitals, if necessary, in consultation with Coordination Committees at other places in the State. The final list applicable uniformly to all Central Government offices within the concerned State shall be notified accordingly and no change can be carried out thereafter. 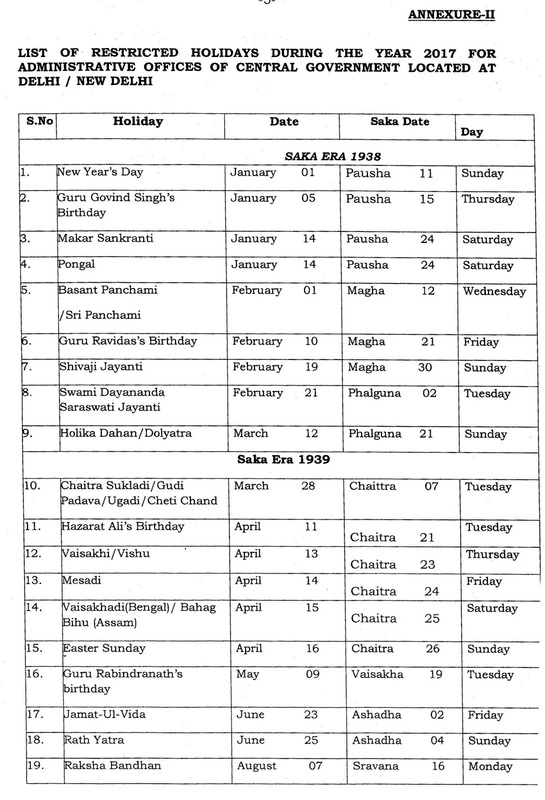 It is also clarified that no change is permissible in regard to festivals and dates as indicated. 12. 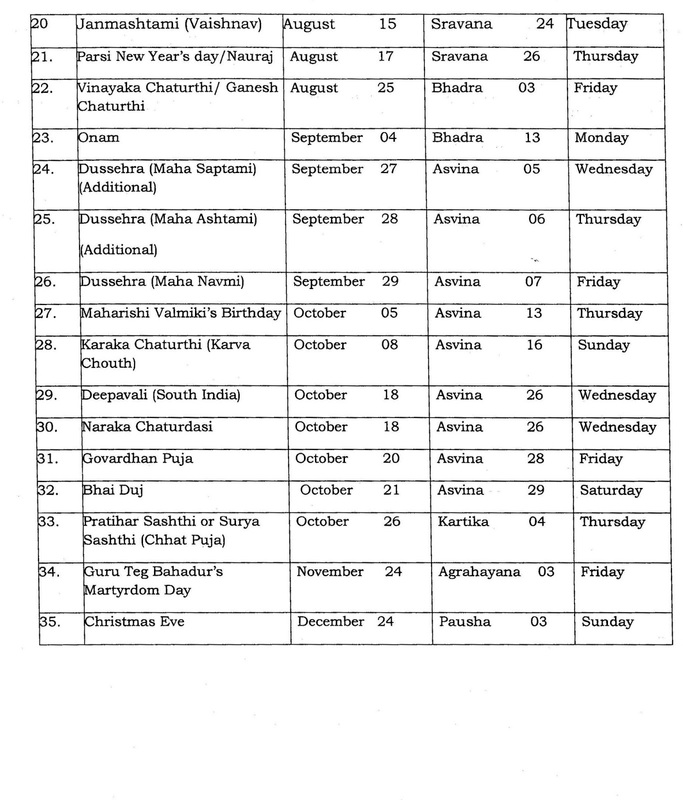 VISHU/ VAISAKHI / VAISAKHADI / BHAG BIHU / MASHADI UGADI / CHAITRA SUKLADI / CHETI CHAND / GUDI PADAVA 1ST NAVRATRA / NAURAJ / CHHATH POOJA/KARVA CHAUTH. 9. 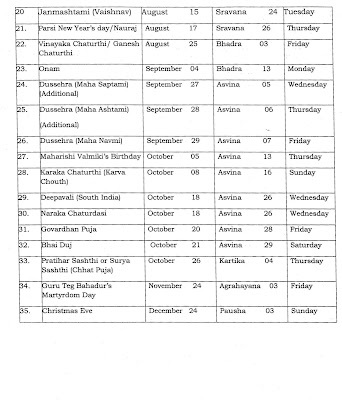 In respect of Indian Missions abroad, the number of holidays may be notified in accordance with the instructions contained in this Department's O.M. 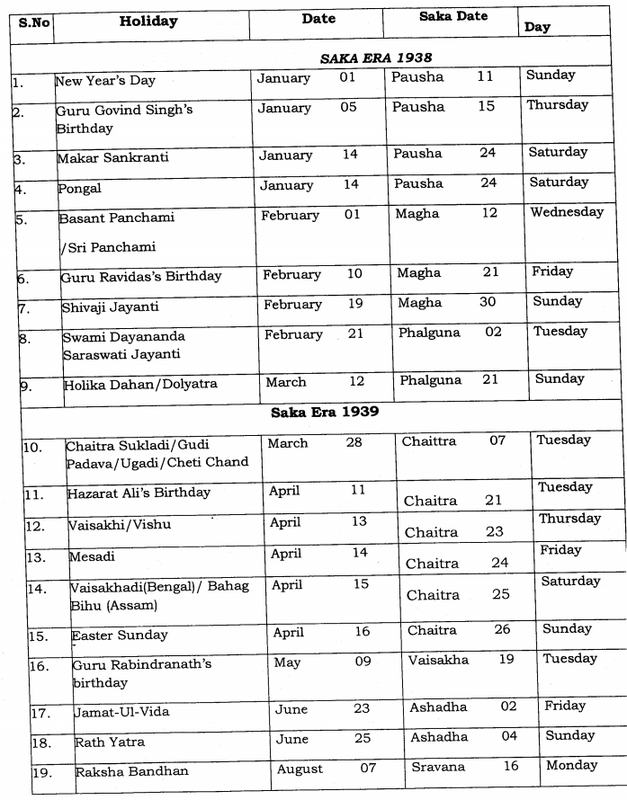 No.12/5/2002-JCA dated 17th December, 2002. 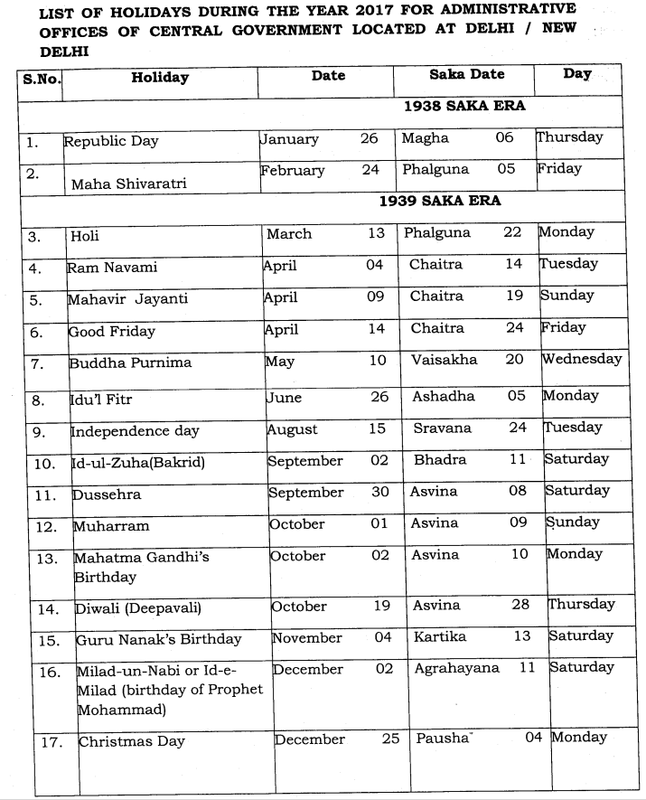 In other words, they will have the option to select 11(Eleven) holidays of their own only after including in the list, three National Holidays and Mahavir Jayanti, Id-ul-Zuha (Bakrid), Vijay Dashmi, Muharram, Guru Nanak Birthday and Milad-un-Nabi(Id-e-Milad (Birthday of Prophet Mohammad) included in the list of compulsory holidays and falling on day of weekly off.